Serpent's Tail 1991 ISBN 1-85242-216-5. 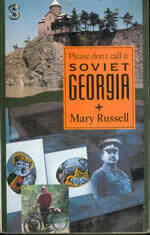 A travel book about Georgia and its people. Georgia is where Jason went to find the Golden Fleece – with a little help from Medea. On 9th April, 1989, Soviet troops entered Tbilisi, the capital of Georgia which was still a republic of the Soviet Union. Russian soldiers gassed people demonstrating in favour of democracy. Seven months later, the Berlin Wall came down and nine months after that, Lenin’s statue was toppled in Tbilisi’s main square. I travelled round Georgia during these uncertain times, courtesy of the Communist Party, sometimes on foot, sometimes by bike. I had gone there not in search of democracy but looking for the Medea myth for Georgia is the historic Colchis, the country where Jason came to in search of the Golden Fleece and where the Medea legend was born. In the legend, she kills her two children so how was it that so many Georgian women were - and still are - called Medea? I found out why but also discovered a great deal more about this strange and lovely country where men dance with knives between their teeth, the wine is of the best and the mountainous region of Svaneti is out of bounds – but not to me.